AC Milan are reportedly considering a trio of talented youngsters to solve their ongoing issue and lack of depth in the wide positions in the final third. The Rossoneri are currently in a battle to qualify for the Champions League this season, with their win over Atalanta last weekend keeping them just above the chasing pack in fourth place. While January signings Krzysztof Piatek and Lucas Paqueta have made an immediate impact, there is still arguably a major flaw in their squad. 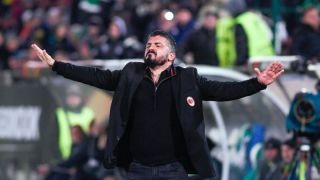 With a lack of depth behind Suso on the right flank coupled with Hakan Calhanoglu playing out of his more natural role on the left, coach Gennaro Gattuso seemingly does have a lack of quality depth in those positions. The Italian tactician will have to make the most of the options at his disposal in the coming months, but Milan are reportedly considering targets to bolster their attack in the summer. As reported by Calciomercato, via the paper edition of La Gazzetta dello Sport, it’s suggested that they’re eyeing three talented young players in Allan Saint-Maximin, Arnaut Groeneveld and Steven Bergwijn of Nice, Club Brugge and PSV respectively. All three players are in their early 20s, and given their recent work in the transfer market, it would fit the mould of what Milan are trying to build at the San Siro with the squad full of young players still developing and improving. Time will which, if any, of the names mentioned above arrive in the summer, but in order to add a new dynamic in the final third with pace, movement and creativity, it would certainly be a smart move for Milan to try and land a signing to address that department.